Knabstrupper of Schimmerwald is a line of breeding, above all intended for the revival of the academic art of riding, today's most sophisticated summation of riding-knowledge during the last 500 years. 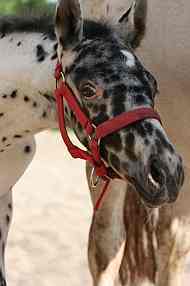 Also, as with most of the so-called "baroque-type" horses, a Schimmerwald horse is very well suited to carriage-pulling, to reining and of course, due to it's very calm, reliable behaviour as a durable and safe recreation-horse. Unlike some other baroque-type horses, the fearless Knabstrupper shows a good ability for jumping, provided it is only demanded in accordance with his height, be it in the riding arena or delightfully on a not to difficult fox-hunt. If trained carefully and unhurriedly, according to his resp. state of development (bodily and psychic state) it will very often get to be extraordinarily capable and prepared to go to great lengths for his owner. Our aim in breeding is to approximate or possibly even better the old Knabstrupper, (a mix of the danish Fredericksborger with the Spanish horse) which in it's time has been one of the most sought-after breeds at the European noble courts. The King of Hannover's great fondeness of his white-born horses let him acquire several of these white Knabstrupper horses, matching the white horse in the flag of Lower-Saxony and serving as horses for the crowning ceremonies. For the use in the modern high-school of riding we need horses in the square-type as opposite to the long, english type, they should be approx. as high as they are long, with a wide chest and well rounded croup to give it good standfastness through covering a short and wide space of ground and thereby a superb dirigiblity. This type of body leads to the necessary steadiness and surety of movement to give it (and consecutively it's rider) the braveness and power for the schools upon and over the earth. If you try to breed a square-type horse, you must take in account that mostly a mare's body is slightly longer than a stallion's. The best tuning of the bodies of rider and horse will be found at a stick-measure (rigid measure) about 20cm (15-25cm) below the height of the rider. This suggests a horse with a stick-measure of 150cm will be best suited for a rider's height around 170cm to achieve a comfortable, balanced seat in all gaits. With this constellation the rider's pelvis is just capable to follow even the most extended movements of his horse, not to endanger the harmony so essential for the high-schoool. The rising trot or hunting-seat are thus unnecessary even in the extended trot or the race-gallop and have been unknown during the high time of the art of riding. The personality of the Schimmerwald-Horse equals less the fearful, nervous, "always on the run"-horse, but a calm, oftentimes more "wait-and-see" , standfast type, and this, too, is a reason for these horses often ending up being the leading ones in a herd. It is a safe utility-horse for old and young, very gifted and always keen to learn new things, always eager to please the ride/handler/driver. Beside the great abilty for the high school of riding these horses are famous for their colouring: there are uncounted combinations: beginning with the simple bay, chestnut or black horses there are spotted and painted horses in all variations: leopard-spotted is the most famous one (look at our Paco, Picasso and Luna), this variation exists also with chestnut spots on white ground; with only some little white spots on a bay or black horse; with a blanket ("Schabracke" in German) over parts on an otherwise white body (see Lulu); with tiger-like stripes of black sort of parallel to the ribs, and so on... Sometimes these colours are so unique and indescribable that the old Danish breeders called them roguishly "green horses". But be warned: should you also get infected with the "Breeder of Knabstruppers-Virus": there is no way to even nearly predict the colour of the planned foal: Our Paco had one leopard-spotted from a bay mare (see Mette-Marit,left); five very different colourde by Lille (few-spotted): a black leopard-spotted (Luna) and a "Blanket-Tiger" (Lulu) and a chestnut-leopard (Line) and a chestnut-leoprad small-apotted (Phidias) and a chestnut-leopard-spotted (Lykke vom Duten); also by other mares: a dark bay from a black, a dark chestnut from a white-born, a chestnut leopard-spotted from another white-born mare,and a black one with white spots on the croupe. Today's Knabstruppers are re-bred from the last specimens of this old danish race, still to be found after the english horse and english riding became the predominant fashion in rider's circles from the middle of the 19th century. Especially in Germany, selfless breeders got infected by Bent Branderup's book "Knabstruppers, the fine Horses of Nobility"(title translated) and a lot of german riders by his extraordinary book " Academic Riding for the Ambitious Recreation-Rider"(title translated). 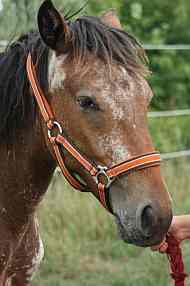 As these horses were often saved by very individualistic horse-owners, many didn't get a proper registration, and many pedigree informations are gone forever with their former breeders. So a Knabstrupperhorse may be a jewel even if there is no pedigree to be found!